Sizing Notes: Runs large in the waist. Please see size chart for detailed measurements. 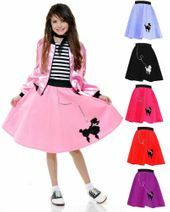 Child size lightweight felt-like polyester poodle skirt in a pretty light blue, with a pink screen-printed cute cartoon poodle and attached sparkly, white ribbon leash detail. 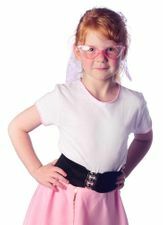 The skirt features a comfortable elastic waistband. The bottom is not hemmed. Shirt, sweater, hair tie, and book not included. Socks, shoes, belt, and glasses sold separately. 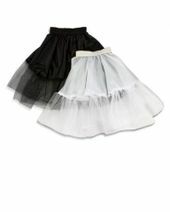 Note: These do run larger than our other children's poodle skirts, please see the size chart for detailed measurements. 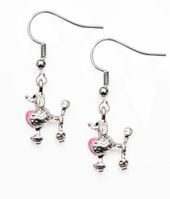 Check out more 50's costumes and accessories for girls in our 50's Costumes department!